When choosing the right eyeliner to create the perfect winged cat eye, there is actually a lot to consider. There are different types of eyeliner, and the kind that you choose will affect the application process and result. So how do you know which eyeliner is right for you? Never fear: I am here to break it down. I’ll explain exactly what each type of liner is good for—as well as my favourite product picks. Pencil liners go on easily, and are great for a subtle everyday look that’s not too harsh. This works especially if you blend it slightly. They are also great for the water line as they won’t make your eye water. However, you have to keep it sharpened and if you get a twist-up pencil, they can get blunt. 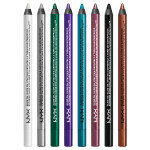 TRY – The NYX Slide On Eye Pencil which is available in 16 shades. Liquid eyeliner is great for creating clean lines and looks that require preciseness. It comes in a variety of forms (felt tip, brush tip, marker tip and sponge tip) but the best for beginners is felt tip liners. My only issue with them is liquid liner can get messy very fast. It takes a while to learn how to apply it properly but the results can be fantastic. TRY – The L.A. Girl Fine Line Liquid Eyeliner. Gel eyeliner might seem intimidating at first but it’s worth trying for the amazing results. 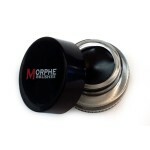 The formula comes packaged in a small pot and you have to use an angled brush to apply it. 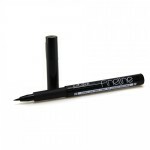 With this type of liner, you get a clean, precise line thanks to the thicker formula and precise brush. The cons of using gel pot liner is that it tends to dry out quickly and if you misplace your brush, you won’t be able to use it. TRY – The Morphe gel liner in the shade ‘Slate’.